“Several members from the Minnesota Army National Guard (Red Bulls) participated in a legal symposium with attorneys and judges from the Royal Jordanian Armed Forces. 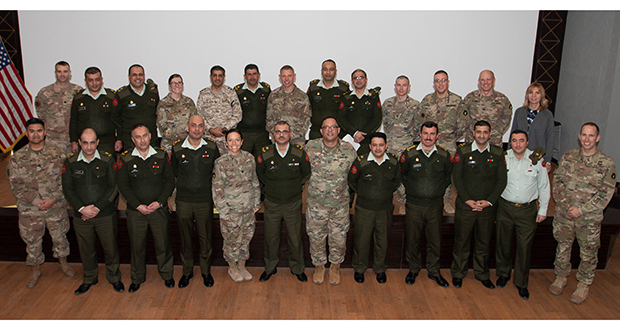 The legal symposium was conducted near Amman, Jordan, in order to build partnership capacity and improve interoperability between the United States Army and Jordan Armed Forces. The Red Bull soldiers presented on International Law, the Law of Armed Conflict, and Military Justice. The attorneys from both countries engaged in a case study about a criminal case involving five U.S. soldiers that took place in Iraq and is featured in the book Black Hearts. Bar Buzz thanks all the Red Bulls for their service.